Long gone are the days when cheerleaders needed to sport school-colored ribbons wrapped around teased ponytails. Dance routines and tumbling tricks have evolved, so don’t let your hair get stuck in the past. Whether you’re spreading spirit at a sports game or fighting for gold at a competition, your hair needs to be secure and out of your face. Besides those two requirements, the style is up to you. Get creative and show them what you have. Turn your average ponytail into a twisty do with a splash of hue. This is best done with a high, slicked-back ponytail as your base. Section your hair off into two pieces, attaching a few colored extensions to one side. Make sure they are secure and have no chance of falling out. If you are brave enough, use a temporary color like a spray-in or hair chalk. For extra spirit points, use your school colors. Tightly twist the two sections outward in opposite directions. Next, take those two twists and wind them together. Secure at the bottom with an elastic band. Cheerleading requires a bubbly personality, so style your hair to match. The bubble tail is another funky take on the old ponytail. Start with a mid-level, slicked-back pony. Tie another elastic a few inches dow, and use your fingers to puff up that section to resemble a bubble. Continue doing this all the way down your ponytail, making sure the elastics are evenly spread apart. Hairspray the hair for extra hold. Get this same look with pigtails by applying the exact technique to each tail. Match your hair to the infamous cheerleading stunt, the pyramid, but with a touch of flare. This is a structured hairdo that has dimension, style and security. Start by sectioning your hair off into three pieces: at the crown, a few inches above your ears and at the nape of your neck. Use a clip to hold the sections apart. Create a slicked back ponytail with the first section at the top of your head. Take a small piece of hair from the bottom of the ponytail, then continuously wrap it around the elastic. Tuck in the end, then secure it with a few bobby pins. Next, make a ponytail with the second section, including the remainder of the first. Continue the same process until all hair is secured. Spray for extra hold. Braids are an easy way to give your hairstyle some girlie decorations. Start off your styling with a milkmaid braid. This is a simple, two-inch French braid starting from behind one ear -- across the front of your hairline -- and ending behind the other ear. Secure with a few bobby pins. 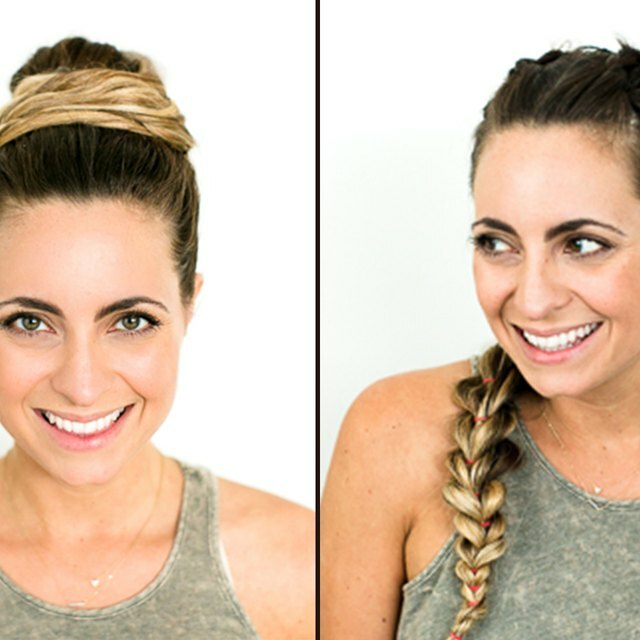 Pull the remainder of the hair into a low ponytail, and secure with an elastic band. Braid the ponytail either in one thick braid or a few separate braids. Secure the bottoms with elastics, and do an overall spray to hold in place.